A clear, concentrated gel for blemish prone and problem skin; penetrates into the skin and helps to dry blemishes and control breakouts. Concentrated formula helps to remove bacterial build-up on the skin. Contains 100% pure Australian Tea Tree Oil, a natural antibacterial agent that helps to control breakouts. Aqua / Water, Polysorbate 60, Melaleuca Alternifolia (Tea Tree) Leaf Oil, Alcohol, Isopropyl Myristate, Carbomer, Triethanolamine, Camphor. Cleanse skin thoroughly. Apply a small amount to affected areas morning and night. For external use only. It is recommended you skin patch test prior to use. 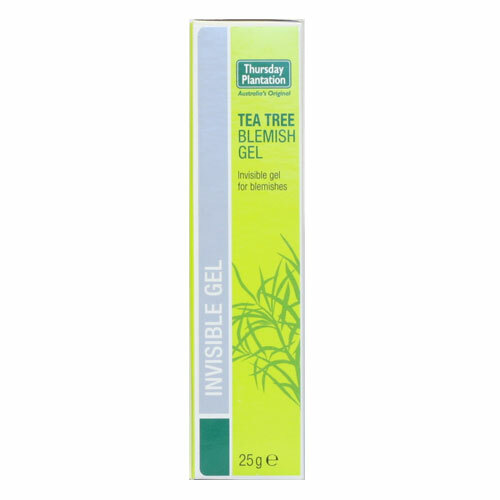 Below are reviews of Thursday Plantation Tea Tree Blemish Gel - 25g by bodykind customers. If you have tried this product we'd love to hear what you think so please leave a review. A clear, concentrated gel for blemish prone and problem skin; penetrates into the skin and helps to dry blemishes and control breakouts.